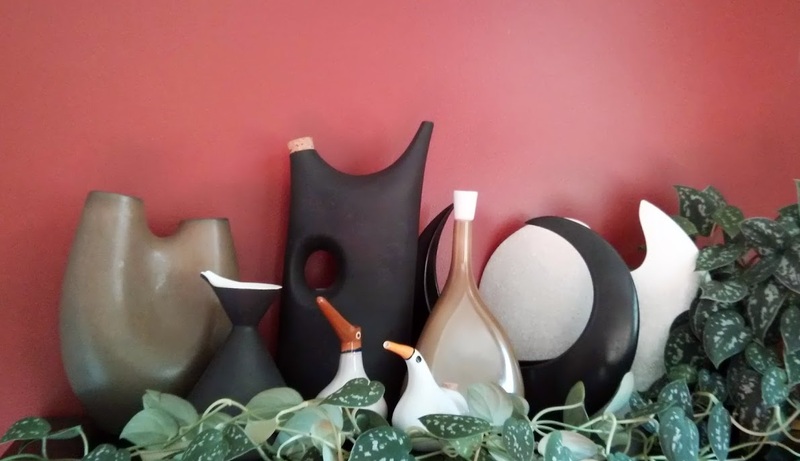 One of our favorite vignettes in the house is our collection of vintage ikebana vases mixed with some of our LaGardo Tackett and Kenji Fujita pieces. Thanks to Laura at Temple of Vintage for the latest additions to the flock! There were a TON of near-misses at the thrifts. We left behind a Kluk-Kluk with no stopper, a chipped Arabia pitcher, and many other almosts. Sadly, we made a mistake on a Joel Myers vase for Blenko and left it behind when we should have brought it home with us. (Le sigh.) But we ended up finding some great stuff, including a Blenko 5922S decanter in Lilac (missing its stopper, sadly) a Finel heart bowl (SQUEE! 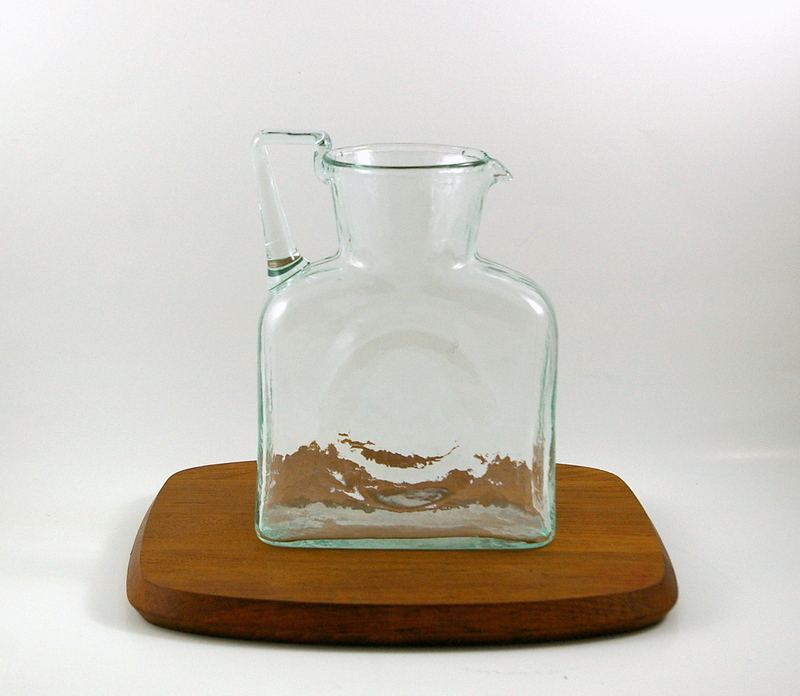 ), and a few other lovelies, including this Arabia “Sauna” pitcher, by Gunvor Olin-Gronqvist. The pitcher is a bit of a mystery. We haven’t been able to find out anything about the history of this pattern, so if anyone has information about it, tell us! We also picked up this amazing bell by David Stewart, in the same color treatment as the fish planter we found a few months back! 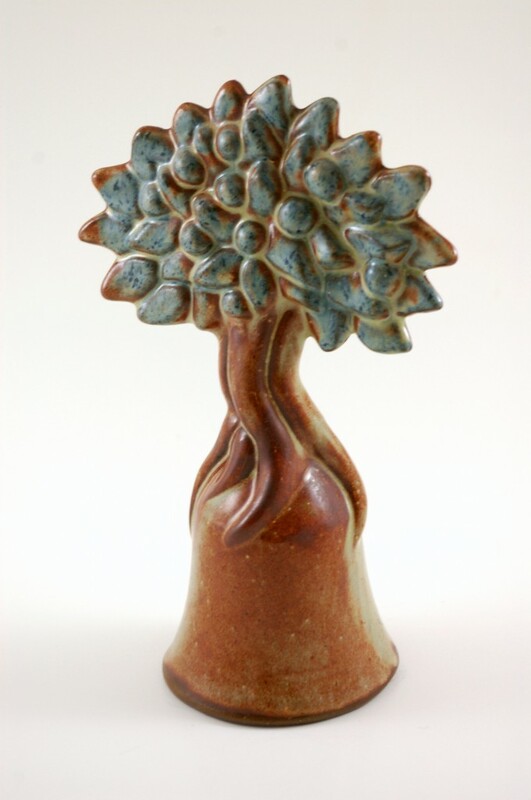 From what we’ve been able to find out, Stewart started producing these pieces around 1980, but we’ve been unable to find out much information about the history of Stewart’s work. Last, but not least, is this Boda cruet, designed by Ernest Gordon. It was one of those pieces that you find and you’re not sure that it’s “anything,” but you have a feeling that you should spend the $.99 and take a gamble. After some sleuthing, Mr. Butter was able to come up with the ID and we were vindicated! Seriously though, these gut feelings are just as important as a catalogue of knowledge. We’ve been hard at work taking photographs of our finds, so everything in the photo will be listed in the shop in the next few days! Last weekend we found these amazing mugs. They’re very large for vintage mugs (4 inches tall and 4 inches in diameter) and they have a great, heavy feel in the hand. 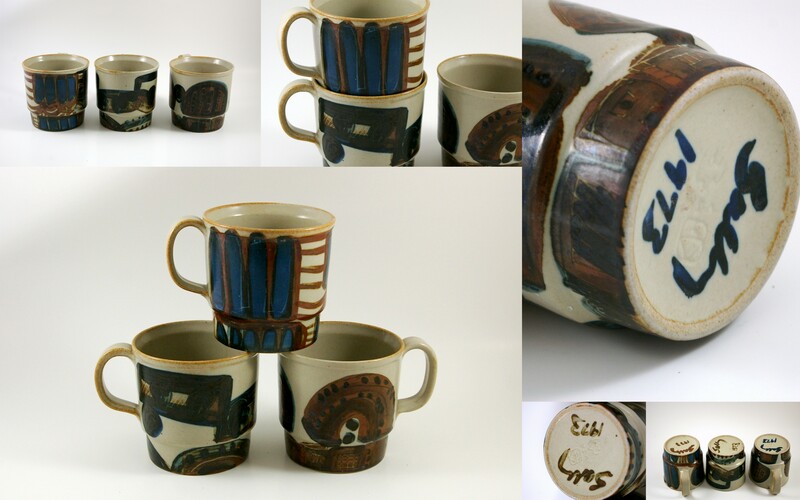 Thanks to @full_upright on Twitter, who let us know that the mugs were made by Iron Mountain Stoneware. These mugs were designed by the founder of IMS, Nancy Patterson. (Patterson’s “NP” mark is under the typical Iron Mountain Stoneware stamp.) Each of the mugs was decorated by Sally Patterson (Nancy’s sister) and is hand-signed by Sally on the bottom. We’ve listed these mugs on eBay — if you’re interested, the listings close on 5-12-2013. Edited to add: This 1975 Reading Eagle article on Nancy Patterson gives some information on the connection between IMS and the Royal Copenhagen company. It seems that Royal Copenhagen produced Iron Mountain Stoneware for national distribution, which clears up a mystery of @Luolashop’s, where Iron Mountain Stoneware has Royal Copenhagen stickers. 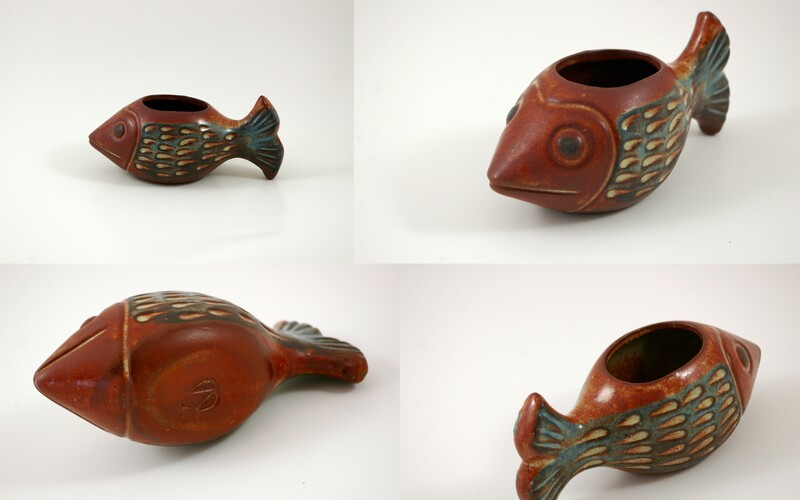 This David Stewart fish planter has such a gorgeous glaze! I mean, really. Does it get any better than this? 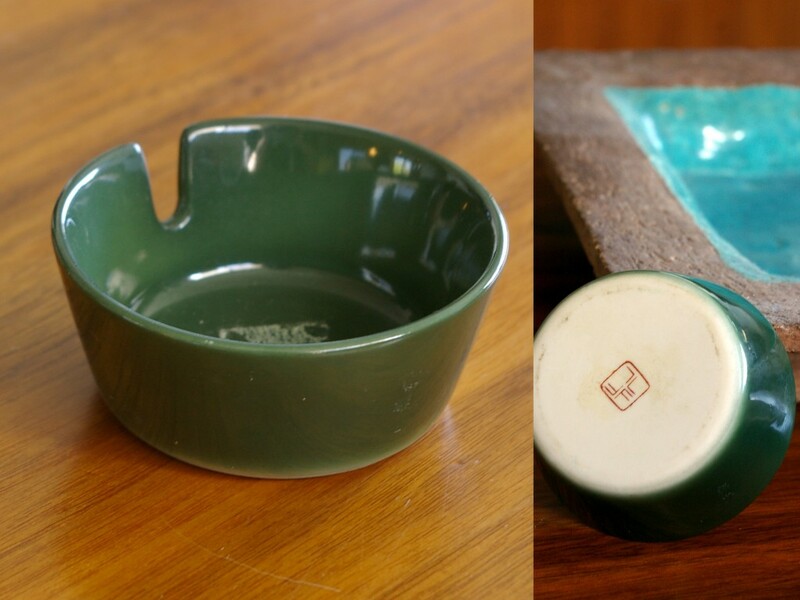 As promised, here’s more about the green ashtray we found on Friday! 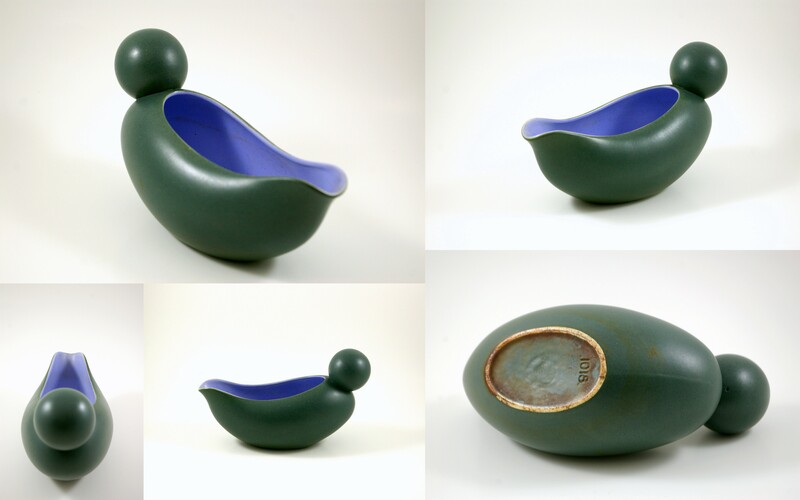 It’s Freeman Lederman personal ashtray in a dark green glaze. 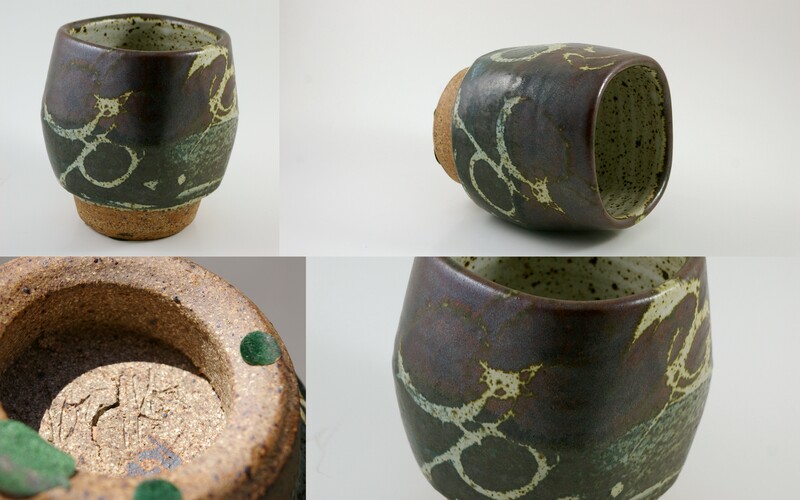 We’ve had some Kenji Fujita cups in the same treatment, but we’ve never seen this form before. Stamped with the FL mark. We went out early on Friday morning and found some great stuff for the shop as well as a few things that will probably stick around the Butter collection for a bit. 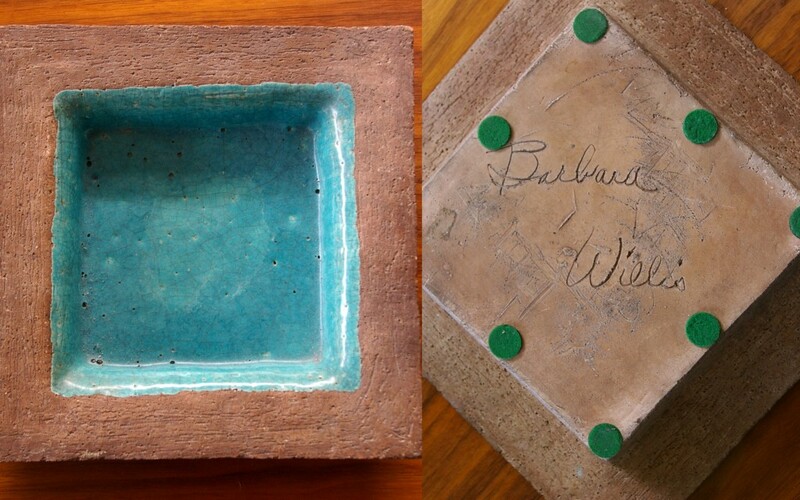 That bright pop of aqua is a square tray by the late (and great) Barbara Willis. This is the first time we’ve handled any of her work and we were very impressed by the weight and feel of the piece. It’s really a glorious example of studio pottery. We’ve already listed the Arabia “Riisposliini,” or rice porcelain, demitasse cup and saucer. So delicate and beautiful. This is only the second piece from this line we’ve found. I’m not sure who made the ram figurine, but it will go up in the shop later this week. 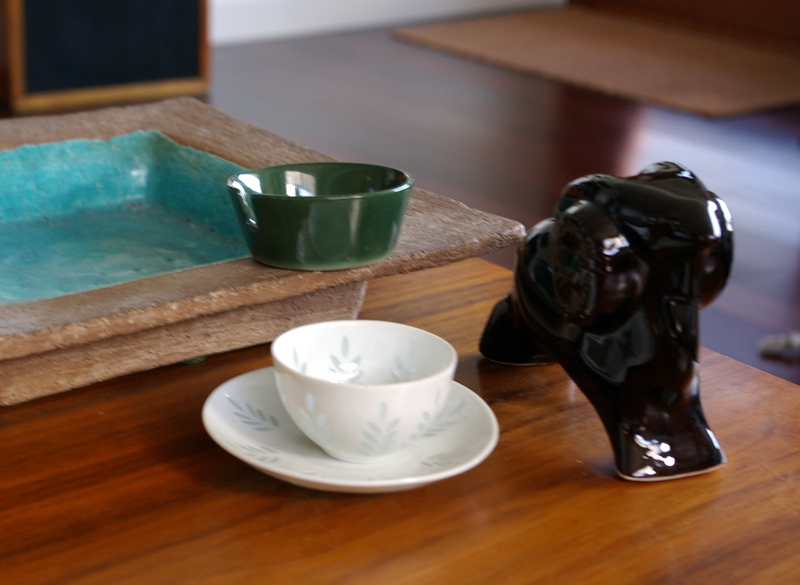 We’ll tell you more about the green ashtray in an upcoming post! For now, have another gander at the Barbara Willis piece! Some other finds include this Blenko Ashtray in Olive Green, which we just listed in the shop and some other items that we’ll be listing throughout the week! Believe it or not, the bairn is almost seven months old, so it was high time we took her down to southern California to visit her grandparents. While the grandparents oohed and aahed over the (not so) little one, we escaped to a few thrifts and antique stores around town and even took a day-trip to visit A La Modern in Los Angeles! 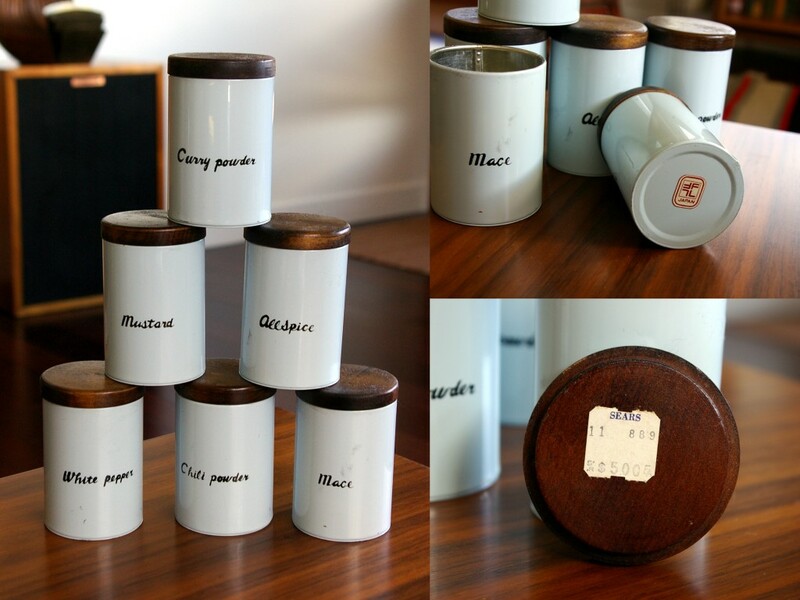 While thrifting in the Central Valley, we found six Freeman Lederman spice jars, which Kevin was very excited about. Freeman Lederman is one of the few things we’re actively collecting right now, so it was great to find these. Unlike most FL, these are metal with wooden lids. They have paper FL labels on the base of the jar. Under one of the wooden lids we found a Sears price tag! 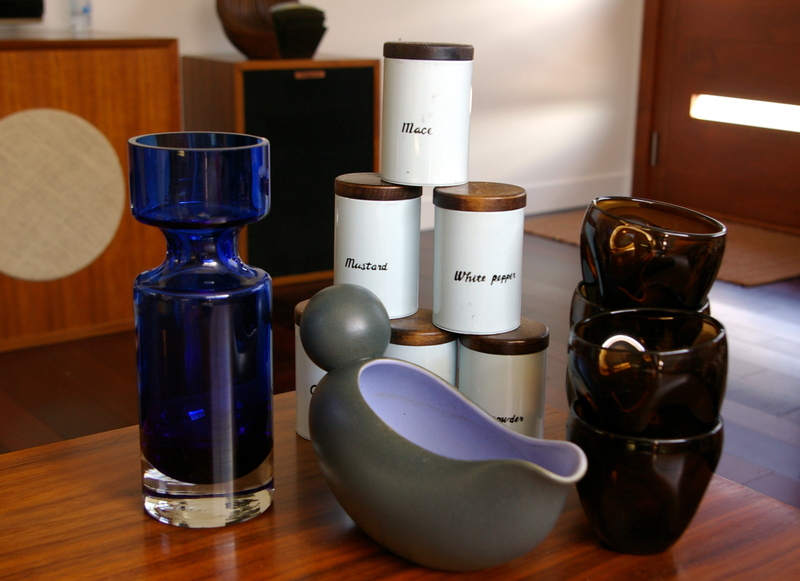 We also found a great Riihimaen vase in cobalt blue and a very cool gravy boat designed by Dorothy Thorpe and produced by Crown Lynn of New Zealand. This particular piece is the gravy boat from the “Pine” pattern. 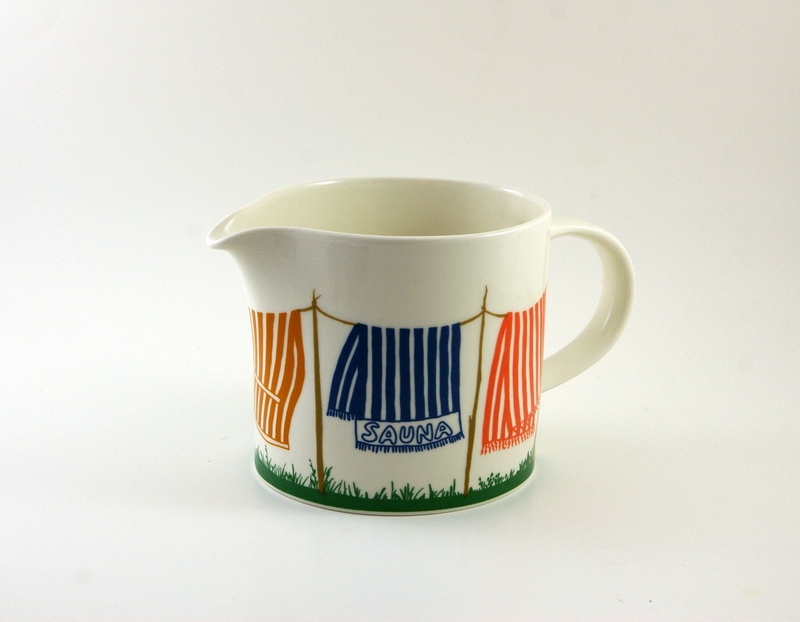 If you haven’t checked out Thorpe’s dishware for Crown Lynn, do a quick google image search — it’s gorgeous stuff! We’ve been bad about blogging. BAD. We’ve found some great stuff, but it’s been so hard to juggle the shop, the bairn, and our lives. Blogging just seems to slip through the cracks as of late. 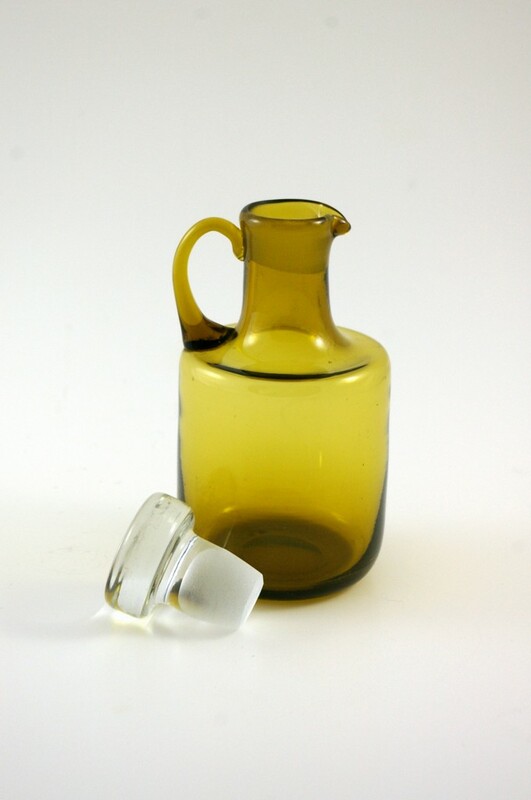 We keep meaning to blog about our visit to a little tiny thrift outside of our usual haunts and the strange little Blenko water bottle we found there. We almost didn’t bring it home with us, but it was different enough that we decided it made the cut! Thanks to the amazing blogger behind A Year of Blenko Water Bottles, we were able to get a little more information about our find. As it turned out, Blenko only produced their #384H Water Bottle for just a few years. Not many of these bottles come down to us today because they’re incredibly fragile. What’s more the water bottle we found was in “Marine Crystal,” a greenish-clear color that was only produced for a few years! We ended up selling this piece on ebay since we had no clue how to price this piece. We’re very glad we decided to pick up this piece of design history and we hope that it enjoys its new home!